There are many differing beliefs regarding who the bride of Yahoshua the Messiah is, and some of the misunderstanding comes from not knowing what is foreshadow and what is real substance (physical vs. spiritual), and some comes from a faulty English word that got inserted into the scriptures by devious religionists. In the Old Testament, the assembly of the Israelites, who are a physical foreshadow of Messiah's bride, was called (in Hebrew) the qahal. In the New Testament, the equivalent Greek word is used to identify those who are the “called-out assembly,” and that word is ekklesia. It is used 115 times in the New Testament. John Wycliffe's English translation of the scriptures in 1382 was the first that used the word “church” for ekklesia. He was a Roman Catholic seminary professor, and he translated from the Roman Catholic Latin Vulgate instead of from the Greek manuscripts. 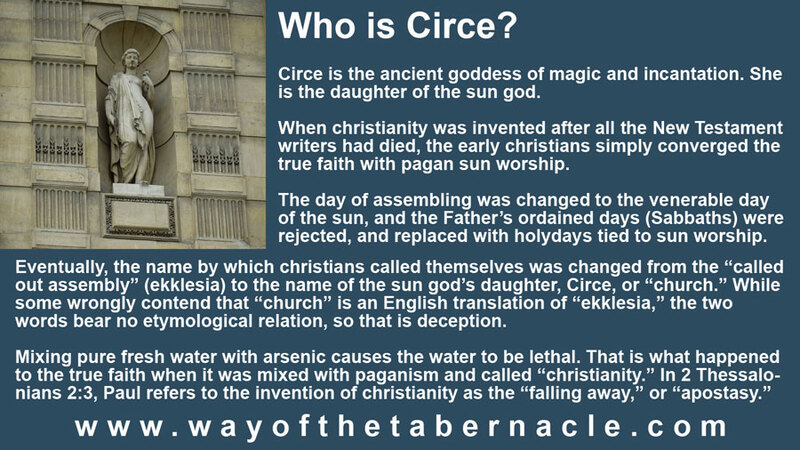 The word “church” has no etymological relation to the Greek ekklesia, and is actually derived from an ancient goddess, the daughter of the sun god, whose name was Circe. “Church” refers to Circe, an ancient goddess—daughter of the sun god. It is said that King James demanded that the Roman Catholic errors in the Latin Vulgate that emphasized absolute rule of leaders were to be kept in his authorized translation. "I am convinced that the King James Translators, laboring under an 'institutional church' mentality, selected the strongest words possible which conveyed the idea that the people must submit to the authority of the clergy. In this way King James could control the people through the Church, of which he was Supreme Ruler" (Norman Park's "It Shall Not Be So Among You"). For additional information about the word “church” click here. Those who have studied the history of “Christianity” from its inception in the fourth century should hardly be surprised that such a reference was used to name the body of its adherents, since that religion stripped away the true foundations of the faith, and replaced them with pagan counterfeits. The new religion of Christianity was essentially a pagan religion that had bits and pieces of spiritual truth mixed in, which is exactly what Satan does with every false religion. So, Christianity is, at its core, a cult of the sun, with some spiritual truth tossed in. The daughter of the sun god, Circe, or “church,” assembles on the venerable day of the sun (instead of on the Sabbath as the New Testament believers did), and they celebrate the pagan Roman Catholic holydays of Christ-Mass and Easter/Ishtar, instead of the prophetic feast days that the Father ordained. Moreover, Christianity teaches a self-declared salvation, often adding in “works” requirements, like keeping up with one's repentance to retain salvation, or obeying the Ten Commandments as a prerequisite, or showing outward signs of spiritual gifts like speaking in tongues. If the church is not Messiah's bride, then who is? So, at the onset here, we can say, quite definitively, that the “church” is not Messiah's bride, but a counterfeit of her. Who, then, is His bride? To understand that, it is vital to see that the Old Testament presents physical foreshadows of future spiritual real substances that are revealed in the New Testament. There are myriad such physical shadows throughout the scriptures, like the Ark of the Covenant—a foreshadow of the bride. It was a wood vessel (corruptible-man) covered in gold (incorruptible-divine), and into it were placed Aaron's budding rod (representing Yah's power), some manna (representing Yah's provision), and the physical covenant—the Ten Commandments (representing Yah's spiritual covenant, who is His Holy Spirit). Another foreshadow of the bride is the physical nation of Israel. There are many physical pictures in the accounts of the Israelites that mirror spiritual real substances (like the Israelites receiving the Ten Commandments, or physical covenant, which is a picture of the bride receiving the Holy Spirit, or spiritual covenant). But, we see in scripture that, when the real substance was revealed in Christ, the physical distinction between Jew and Gentile was abolished (Galatians 3:29). The real substance that is revealed is that being a true Jew in Yah's eyes is actually a spiritual thing, and not a physical one. Paul tells us in Romans 2:29 that “. . . he is a Jew who is one inwardly; and circumcision is that which is of the heart, by the Spirit, not by the letter; and his praise is not from men, but from Yah.” This means that those who are indwelt by the Holy Spirit are the true Jews—a spiritual designation, not a physical one. Moreover, the physical Jews are who made up the physical nation of Israel. Now, as the physical is only a foreshadow of the spiritual, then the spiritual real substance of Israel is what is comprised of the spiritual real substance of the Jews. It is everyone who has received the covenant of marriage (Holy Spirit) from the time of Messiah's resurrection until the fulfillment of the Feast of Trumpets, which will be when the bride is gathered in the air to the Bridegroom. 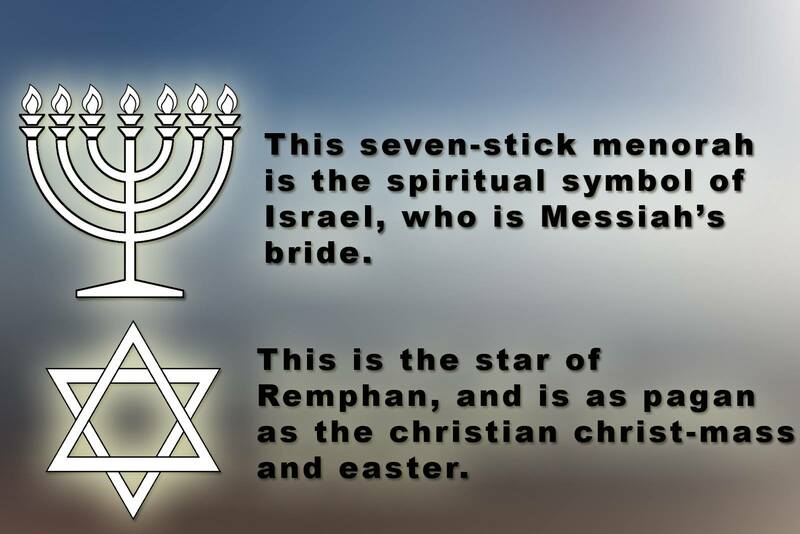 Thus, the spiritual real substance of Israel is that she is Messiah's bride. After she is caught up in the air to the Bridegroom, she will enter the wedding chamber, and she will not be revealed until the wedding feast, according to the wedding traditions, and that is what we see in Revelation 21:2. The union of the Lamb and His bride is the New Jerusalem—the eternal dwelling place of Yah the Father. Also, the word “Israel” literally means “rules as God,” and that is exactly what the bride will do in eternity, as priests and kings, because of her marriage to the King of heaven. Most inhabitants of heaven will actually dwell on the new earth, as the New Jerusalem is the bride, and the size of the bride is relatively small compared to the friends of the Bridegroom (Old Testament saints), friends of the bride (tribulation saints), and wedding guests (Millennial saints). So, what is the “church”? Messiah's bride's name is Israel, but who exactly is the “church”? Well, we know that “Christianity” was invented (or, at least codified) by Constantine in the 4th century A.D, and that is what became the Roman Catholic Church. With Rome being the titular head of Christianity, and it calling itself the “church,” it is safe to say that the “church” actually originated in Rome, and is the religion of Rome. Of course, we know there are many flavors of the religion, as Protestants claim to be wholly separate from Rome. But, protest as they might, they are actually more related to Rome than they are to the truth. The “reformers” that came out of Rome did not actually reform anything back to its true foundations, but simply created a version of Christianity that is Roman Catholic Lite, as they still adhere to the basic churchian system of Rome (SUNday assembling, pagan Roman holydays of Christ-Mass and Easter/Ishtar, works-based or self-declared salvation, etc.). Scripture tells us that the great whore of Babylon is headquartered in Rome (the city of seven hills—Rev. 17:9), and her tentacles reach across the planet to everyone who embraces her system of belief, which is what Christianity does—the false system that is devoid of the true foundations of the faith, and was invented by Constantine and his Roman cohorts. That entire system, called the “church,” or “Christianity” is actually the great whore of Babylon, which is the masterful counterfeit that Satan has promulgated throughout the centuries. 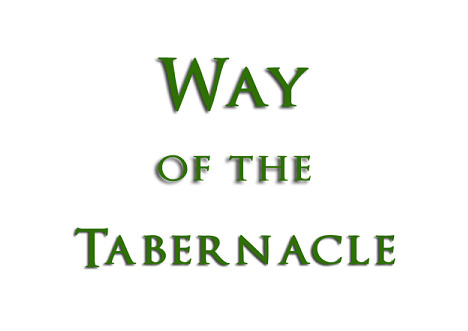 It is “Christianity,” or the “church” that leads men away from the Father's traditions, which Paul and the apostles taught the Gentile converts (1 Corinthians 11:2, 2 Thessalonians 2:15), and toward the pagan traditions of men. I have had many long discussions with multitudes of churchians who have been brainwashed by the false system, and along the way, a few have seen the light of the Spirit's truths, and have ended up rejecting the false, churchian, traditions of men, as I did—embracing the truths that the Spirit Himself teaches to those whom He leads. Typically, the ones who are hardest to reach are the purported “pastors,” who see themselves as the “infallible bearers of truth.” One of the ones I am currently in a very long conversation with sees himself like that, but ultimately many are blinded, not only by Satan's deceptions, but also by their own pride and arrogance. They are simply unwilling to do what so many of us who were raised and educated in the “church” have had to do—reject it all, and allow the Holy Spirit to instruct us in His truths. Some try to add the Spirit's truths to their current volume of knowledge, like teaching both churchianity and Yah's feasts, but that will not work, as truth and error cannot co-exist, just as light and darkness have no fellowship. The “pastor” with whom I have had such a lengthy conversation would be faced with a difficult task, if he actually yielded his arrogant will to the truths of the Holy Spirit. He would have to tell his congregation that he misled them for all those years, and he would bear the shame for having done that. Moreover, he would have to step down from that position long enough to be fully trained in the Spirit's truths—a period of time sufficient to be able to teach those truths to others. He would also have to accept the evidence that is given to those who are seen as believers by the Father, as we are told in 1 John 5:10. Currently, he does not understand or accept that, because he is blinded by churchianity's self-declared salvation that is false. That same verse explains how the Father sees those who reject that evidence. For their sakes (and his), how great the eternal benefits would be if he would put aside his human pride and ignorant arrogance, and allow the Spirit of Yah to instruct him in His truths! But, so far, he continues to argue for his particular flavor of false churchianity (Baptist)—to prove how vast his “knowledge” is. And, in so doing, he rejects the Spirit, and even mocks His truths, which are wholly opposed to his man-made doctrines. I do pity him, and the knowledge of what he rejects daily makes me sad for him. But, Yah is just, and this “pastor” will be shown at his judgment that he was offered the Spirit's truths, and rejected them, if he remains in the false churchian belief system he is in right now. Just to clarify here—the bride is the ekklesia, but the ekklesia is not necessarily the bride. The ekklesia are those who are called out by Yah to be His. The Old Testament saints were His called-out assembly, just as the bride is today, but the Old Testament saints are not the bride; they are the friends of the Bridegroom. The tribulation saints will be the ekklesia after the bride is removed from the earth, but they are not the bride; they are the friends of the bride. The Millennial saints will be the ekklesia during Messiah's 1000-year reign, but they will be the wedding guests in eternity. Yah is calling His children out of the world's false belief systems, and the “church” is one of Satan's most successful deceptions. There are approximately 2.2 BILLION people on the planet who identify with "christianity" and the “church,” and who proclaim a false named messiah (Jesus). But, Yahoshua the Messiah said of life in Him, “ . . . and few there be who find it.” The difference between life in Him and the broad road belief system called “Christianity” and the “church” should be seen quite easily, but, sadly, most will not recognize His truths, and 2 Thessalonians 2:11 tells us they will eventually be sent strong delusions by Yah, and be turned over by Him to believe a lie.